In high school, cool, physically gifted (but dumb), Jenko (Channing Tatum) harassed nerdly, physically weak, Schmidt (Jonah Hill). Fast forward 7 years, and both are in the same Police Academy class where they form a team to help each other get through. Schmidt tutors Jenko, and Jenko helps Schmidt get through the physical aspects. A perfect team. Well….not really. After blowing their first potential bust (“You have the right to be an attorney…”), the two still youngish looking cops are sent to a special law enforcement unit at “21 Jump Street” to help bust a drug ring in a local high school. The two are still somewhat incompetent cops, and the movie deals with the trials and tribulations (and stupidity) of them trying to find the source of the drugs. 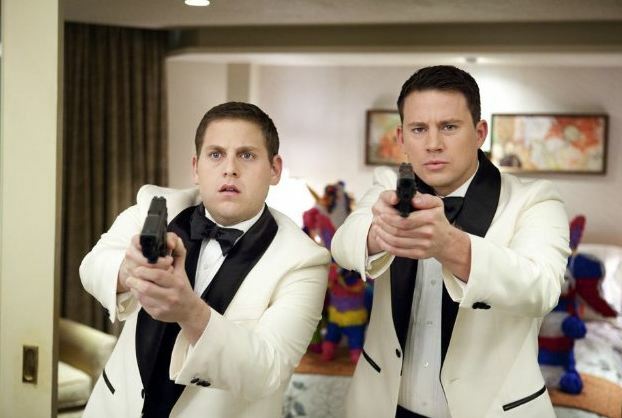 “21 Jump Street” starts out interesting and funny, but, when the high school hi-jinks start, the movie becomes confusing and cluttered. Some very funny moments, some very shocking moments, but, overall…..average. Not for kids! True to it’s R rating, the f-words fly, the raunchy activity flows, and the gore, at the end, is yucky (yeah…a technical term :-)). You will love a cameo by a huge star!